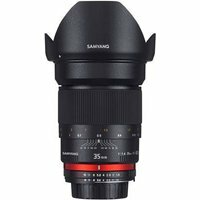 The Samyang 35mm f1.4 AS UMC is a fast, wide angle, manual focus prime lens for full frame cameras and APS-C sensors. Perfect for landscape, journalism, portraiture and everyday picture taking, this professional prime lens delivers exceptional resolution and sharpness with ultra-smooth out of focus backgrounds. The wide apertures of the 35mm provide beautiful bokeh, which is perfect for portrait type applications where ultra smooth out of focus backgrounds or foregrounds is preferred. This technique helps to separate the subject from the background giving very pleasing and professional results. Aided by its 8 aperture bladed design, the smoothness of the bokeh provided by the Samyang 35mm is excellent.